When I found the duck in the frozen food section of my Costco, I knew what I wanted to do with it. I wanted Peking Duck. I could't make it completely like they do in China, but I think I came close. I have not ever had Peking Duck, so I'm not sure if I came close or not, but our Chinese teenager assured me I did indeed make a very yummy Peking Duck. My husband even agreed that it was delicious cold, which is what happens when you are waiting for who knows what. Getting my family to the table to eat my food while it is hot can be just as challenging as preparing the food. Beautiful crunchy delicious skin, oh my goodness I'm feeling hungry just looking at this picture. 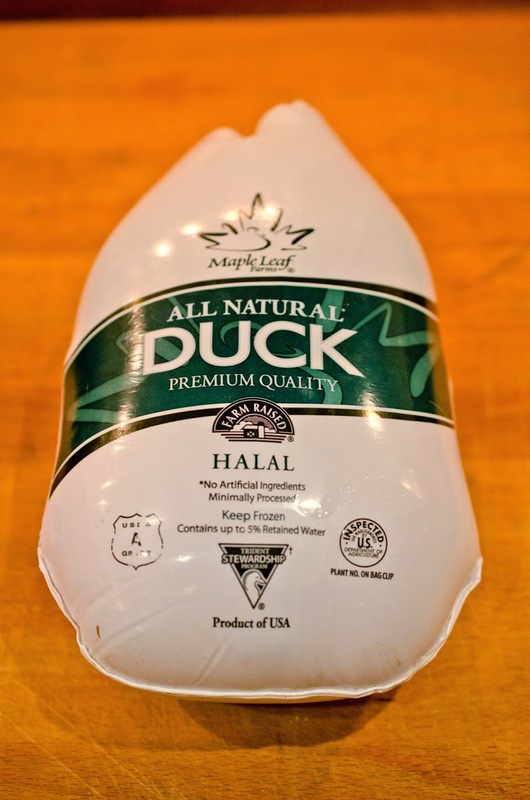 It starts with this, a delicious Kosher and Halal approved whole duck. I think I got a 4-5 lb. duck. only cut the fat layer and not the tissue. Fill a large stock pot 2/3 full of water and bring to a boil over a medium-high flame. Using heat proof and water proof gloves slowly submerge half the duck in the boiling water. See the bumps, I was giddy when I saw the bumps. 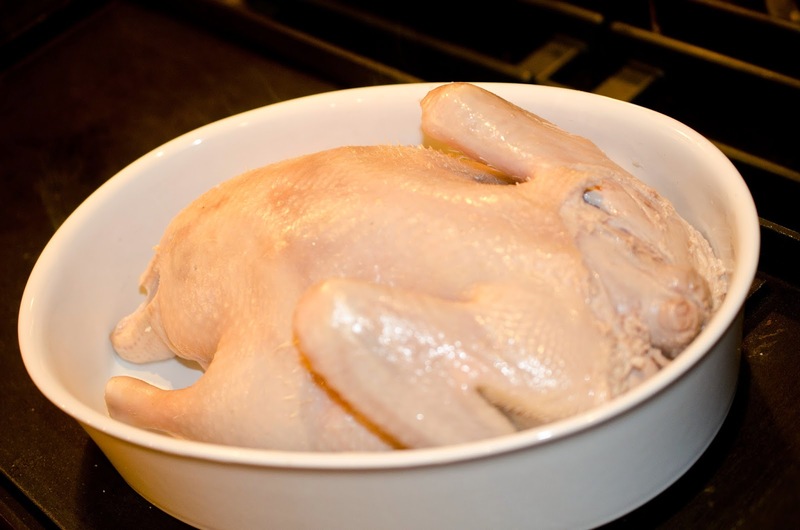 Place duck in a large dish and place in the refrigerator. Allow to dry over night. 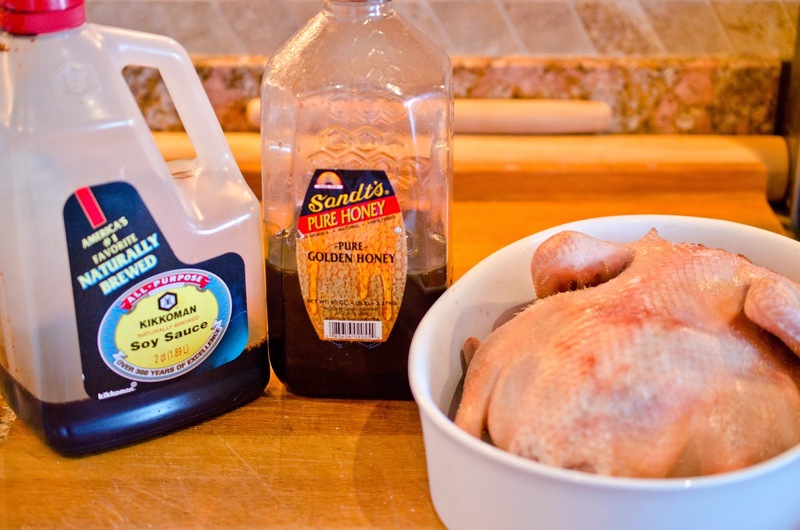 Mix the honey and soy sauce together in a small bowl. 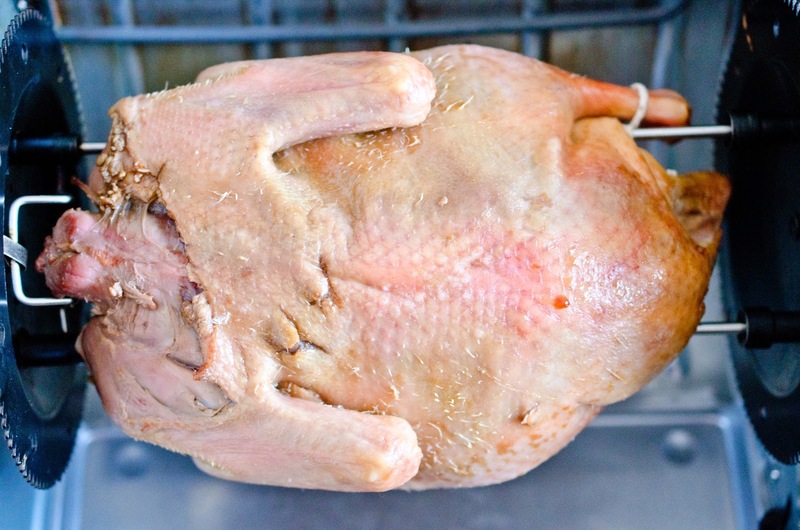 Using your fingers and the handle of a wooden spoon loosen the skin of the duck and create a pocket under the skin. In China they blow air between the skin and the duck to achieve this step. Try to disconnect as much of the skin from the fat as you can. Using a basting syringe, squirt the liquid under the skin of the duck. Place duck on a rack in the dish. Remove extra sauce from the dish. Refrigerate for 24-48 hours. Flip half way through to ensure it dries properly. In China Peking Ducks are dried hanging upside down in special drying chambers. Tie the legs on the duck together so they don't come loose. Place on the spit of a rotisserie. 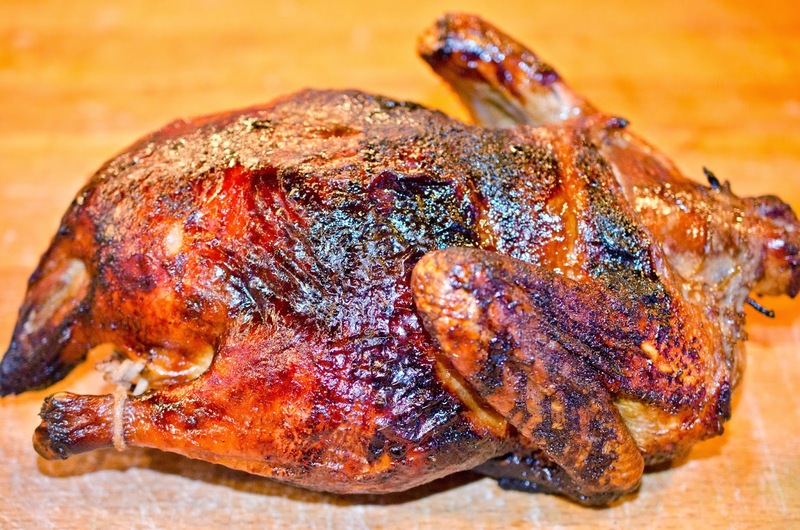 In the rotisserie, cook for 15 minutes per pound, and allow to rotate without heat for 15 minutes. remove meat. Our Chinese teenager told me that. 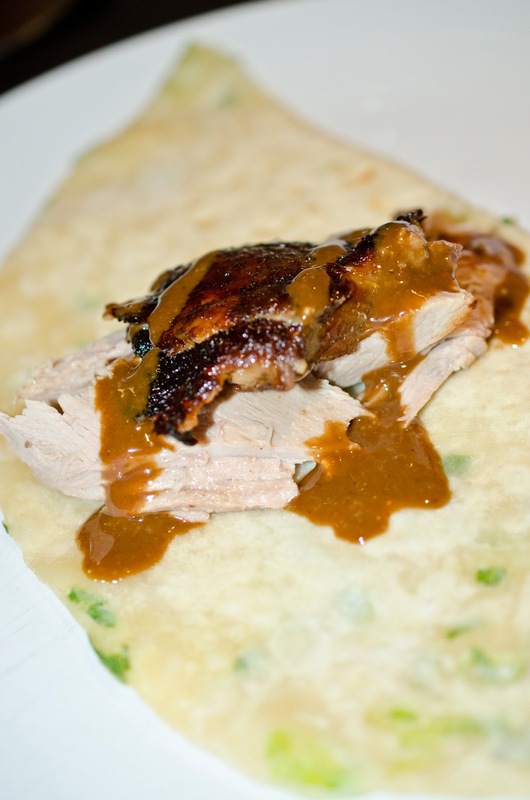 Serve a few small pieces of duck, a piece of crispy skin and some Hoisin Sauce on a Scallion Pancake. 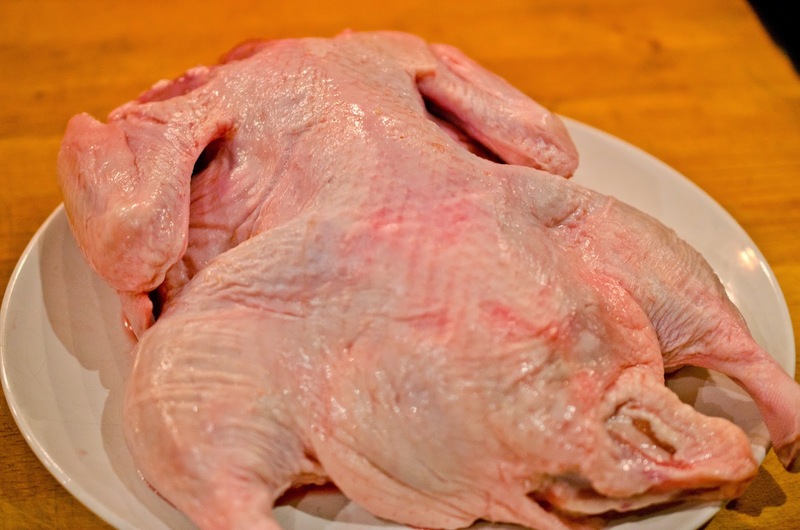 Remove the duck from its packaging and remove all the giblets and neck from the cavity of the duck. Using a sharp knife make small slits all over the duck, doing so at an angle so you only cut the fat layer and not the tissue. Using heat proof and water proof gloves slowly submerge half the duck in the boiling water. When you see goose bumps, or should I duck bumps, flip the duck over and do the same to the other half. 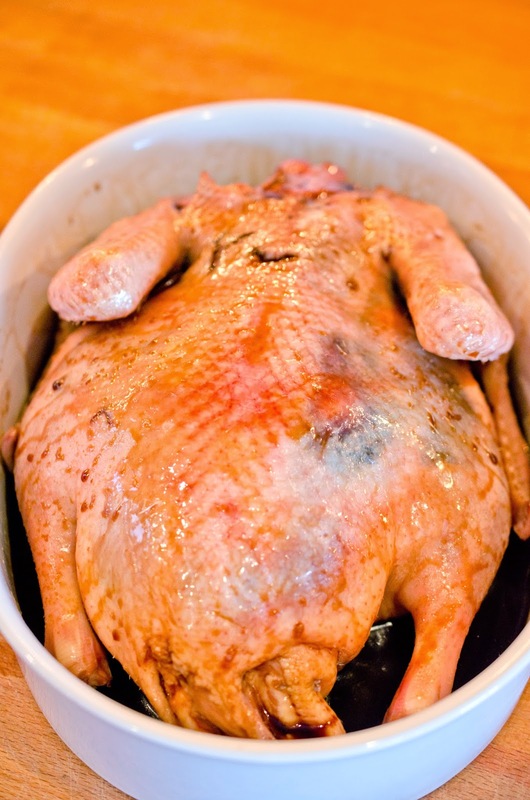 Using your fingers and the handle of a wooden spoon, loosen the skin of the duck and create a pocket under the skin. In China they blow air between the skin and the duck to achieve this step. Try to disconnect as much of the skin from the fat as you can. Tie the legs on the duck together so they don't come loose. Place on the spit of a rotisserie. 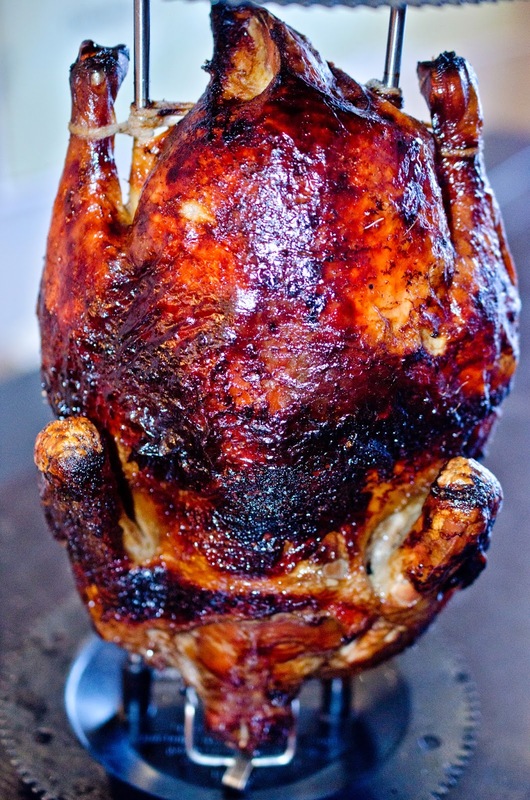 In the rotisserie cook for 15 minutes per pound, and allow to rotate without heat for 15 minutes. Using a small chefs knife remove skin first then cut the meat off the bones. Wow this looks delicious! The duck is beautiful. I've never heard of pecking duck but it looks amazing. I'm glad David said it was so authentic. And now that I've had it, I have to say it was delicious! My favorite part were the scallion pancakes, and the crispy duck skin and hoisin sauce make this a treat to eat. Our Chinese student liked it too!